28 March 2019 – In partnership with the Lion Recovery Fund, Africa’s leading ecotourism operators, andBeyond, Conservation Travel Foundation by Ultimate Safaris, Singita, and Wilderness Safaris, have joined forces to launch the Lionscape Coalition – an innovative initiative that has seen four commercial competitors come together to help secure a future for Africa’s lions and their landscapes. Africa’s lion population has halved in the past 25 years, and the species is now officially classified by the IUCN as ‘Vulnerable’, with the West African subspecies ‘Critically Endangered’. Habitat loss and fragmentation, illegal wildlife trade, bushmeat poaching and human-lion conflict continue to threaten lions across Africa. Yet lions are a resilient species and a turnaround is still possible if these key issues are addressed. “The initiative taken by the Lionscape Coalition’s founding partners to look past their business imperatives and collaborate sends a powerful message that conservation is part of good business. Collectively, &Beyond, Conservation Travel Foundation by Ultimate Safaris, Singita, and Wilderness Safaris boast more than 100 years of positive conservation and community impact and work across ten African countries”, he added. Underpinning their commitment, each member of the Lionscape Coalition has made an annual philanthropic investment into the LRF. Half of the amount contributed is directed to projects in countries where the member operates, while the other half is utilized at the discretion of the LRF’s Granting Committee. In this way, these ecotourism companies are making a direct contribution to lion conservation beyond the boundaries of their direct areas of operation. The strategy of this dedicated initiative focuses on three critical aspects: expanding conservation coverage by increasing the extent and effectiveness of the management of ‘lionscapes’ across Africa; the building of public, political, and philanthropic will, creating a collective intent across the spheres of governments, non-profit organizations, philanthropists and the general public; and the scaling of funding, elevating the amount of funding available for the conservation of lions and their landscapes. Africa’s ecotourism is intrinsically linked to the health of its iconic wildlife populations and their captivating landscapes. As an undisputed favorite for safari guests, losing lions will not only have dire ecological consequences, but will jeopardize the tourism industry itself, the jobs it creates and the many national economies to which it makes such an important contribution. The future of Africa’s irreplaceable wilderness and wildlife and its tourism industry are inseparable from the future of the African lion. 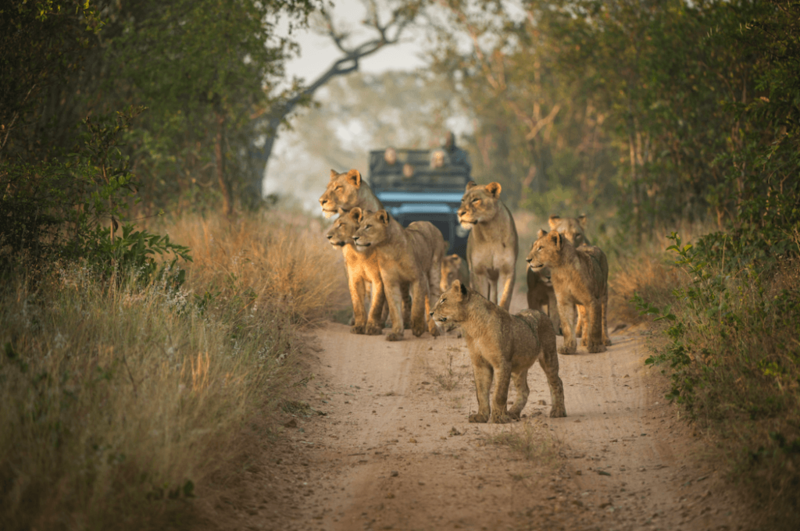 The Lionscape Coalition shares the LRF’s bold vision to double the number of wild lions in Africa. The Lionscape Coalition is a joint initiative between the ecotourism industry and the Lion Recovery Fund that enables Africa’s top operators to play a leadership role in the recovery of lions and the restoration of their landscapes. Founding members of the Lionscape Coalition, &Beyond, Conservation Travel Foundation by Ultimate Safaris, Singita, and Wilderness Safaris, have made philanthropic investments in lion conservation programmes through the Lion Recovery Fund, and work to promote awareness and philanthropy by their guests before, during, and after their journeys. The Lion Recovery Fund (LRF) was created by the Wildlife Conservation Network in partnership with the Leonardo DiCaprio Foundation to double the number of lions in Africa, regaining those lions lost over the past 25 years. In recovering lions, the LRF also aims to restore the health of their landscapes and all that they provide for local people and wildlife. The LRF sends 100% of donations directly to projects that conserve lions, investing in the best ideas for lion recovery, and supporting projects beyond any singular country across lions’ entire range. The Wildlife Conservation Network (WCN) has a unique approach to saving endangered species; seeking out and supporting conservation initiatives that protect endangered species and help wildlife and people coexist. Through its Network, WCN invests in a select group of effective conservationists by providing financial support for their conservation programs and the tools and services they need to succeed. Through its Crisis and Recovery Funds, WCN invests in the best ideas to end extinction crises and bring a threatened species back from the brink, supporting a wide breadth of projects that protect a threatened species across its entire habitat.